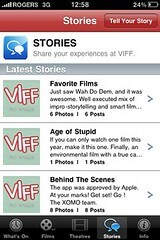 The “story” section is where people who have the app can add notes, feedback, reviews, and talk about everything VIFF. You can post updates that include photos as well. 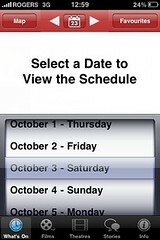 I asked the developer if they would be pulling in the #VIFF09 tag from Twitter but the content is staying pretty much exclusive to iPhone users. In the future, a social media integration would be great but given the amount of data already available and the fact that they did take the time to add in a networking element, it’s pretty impressive. Also for the price, it simply can’t be beat. 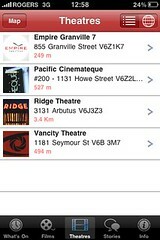 VIFF wraps up on October 16th so if you’re still looking to get out and view some of the hundreds of films screening around town, this app can certainly help you out. Disclosure: I have been writing disclosure statements on my blog post reviews for the last 5 years. I have never been paid to write reviews although sometimes I get free product (in which case I mention that at the bottom of each post). Sometimes, I just really like something and want to write about it, which shouldn’t be a far-fetched notion. 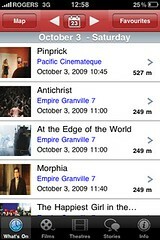 As for this free application, I was not paid in any way by VIFF to write about or endorse it. Hope to see you at the VIFF! This is fantastic. 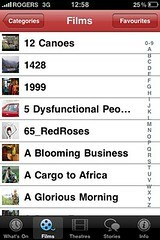 Because of you, I now know that this app exists. I’ve downloaded it, and it is simply awesome. Thanks for sharing!